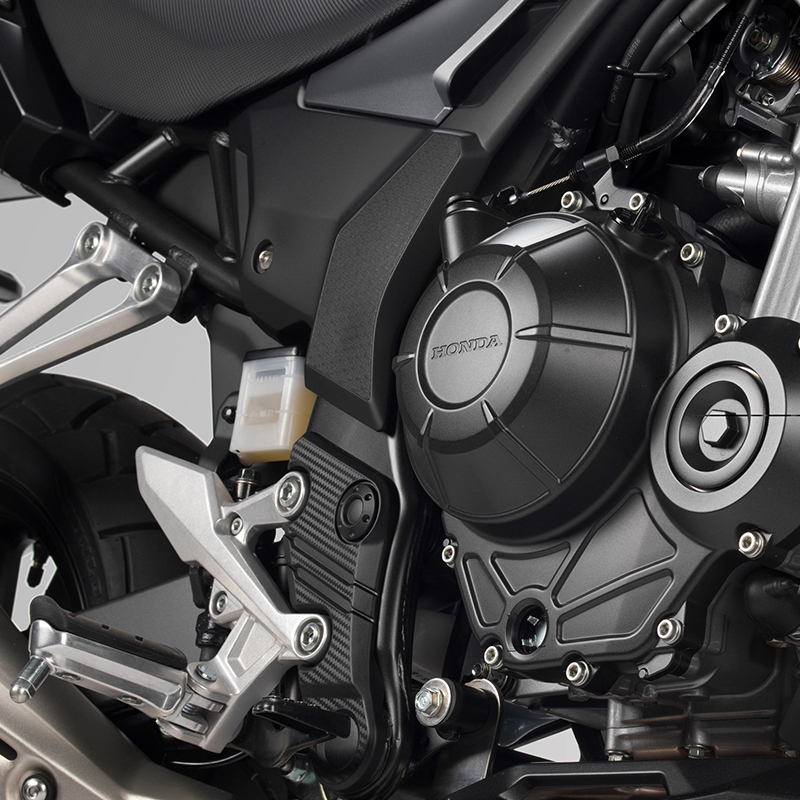 The CB500X midsized, parallel-twin-cylinder machine remains one of the most manoeuvrable, rider-friendly, easy-to-own motorcycles on the road and now performance updates encourage a greater sense of adventure. With a 19" front wheel, more aggressive tyre treads, increased front and rear suspension travel and updated styling with a more upright riding position, the CB500X is truly adventure-ready, and improvements to the engine's intake tract, valve timing and exhaust result in increased torque and crisper throttle response. Engine refinements for an increase in overall power, including 3 to 4% more torque from 3,000 to 7,000 rpm. Fuel-injector spray narrowed, fuel-droplet size optimised for improved spray penetration in intake. Improves combustion and therefore creates more linear power from first crack of the throttle through to rpm redline. Smaller battery, repositioning of components enable increased air-intake volume and addition of filter element in tract below headlights. Straighter velocity stacks and reshaped separators between the cylinders make for decreased turbulence, resulting in improved power at every rpm. New valve timing increases torque and improves roll-on response. New crank-sensor system with over 2.5 times more-frequent crank-position readings and model-specific fuel-injection settings allow more linear power delivery, with emphasis on low- and midrange power and more precise throttle response. New muffler with increased volume before and after catalytic converter. Back pressure optimised for improved low-end and midrange power. New dual-outlet muffler tip makes exhaust note racier-sounding to match new power. New transmission gear-dog design is more precise for more accurate, sure shifting action. New slipper clutch design adapts to load stresses for increased hook-up under heavy acceleration and reduced engine braking under downshifting. New clutch design, with the same engineering found in the CBR1000RR, decreases lever pull by 45%, especially helpful in stop-and-go traffic. Lever shape improved as well. Larger, 19" front wheel for better bump absorption, improved high-speed handling. New front and rear tyre design with deep-grooved tread. New shock with advanced pressure-separation design from Honda's large sport models is more stable and predictable for improved rear-wheel tracking and traction. Increased suspension travel for improved performance through stroke, reduced bottoming and increased ground clearance. ABS upgraded modulators improve precision during ABS engagement. Revised hydraulic ratio in rear brake, combined with ABS, achieve improved brake modulation in low-traction situations. Lighter seat rails for improved mass centralisation and better handling. New, full-featured display has larger screen and thinner bezel, includes new upshift indicator that can be set to different rpm settings. Turning radius reduced by nearly 8 inches for easier manoeuvring. Windscreen is 20mm taller for great wind protection during high-speed cruising. Seat narrowed above pegs to aid touching feet to ground at stops. New tapered handlebar improves feedback, control and style, while new rubber-mounted handlebar clamp minimizes vibration to rider's hands. More aggressive adventure styling with new fuel tank, radiator shroud, headlight, clear taillight lens and new LED turn signals. New shroud design helps direct radiator heat away from rider's legs.